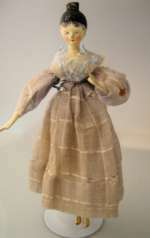 8,6" (22 cm) Very good early empire peg wooden doll ca 1810-20 with high empire defined waist.Fully jointed body,Yellow slippers, fine detailed hair with brush strokes and a tuck comb.Dress and underwear is silk. Dress a little fragile. No repaint or retouch. Minimal flaking.She is the very early Grödnertal dolls, with the special body for this time. 20 cm is this rare seen car from Germany. 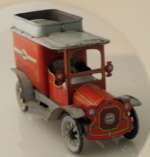 A tinplate OROBR Delivery van with rare litho. 1920. Very special is the small car painted at the sides. No restore..Wind up, fine function! 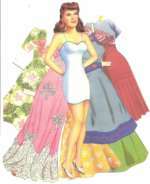 Dinah Shore paperdoll, old moviestar. Betty Bonnet 7 different Sheets, ladts home jornal 1916-18.Original! 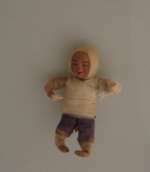 4" (10 cm) is this rare seen Child christmas figure in pressed cotton with great molded face with character.Painted white/blue dress.. All original.A great item.Christbaumschmuck gepresste Watte. Christmas Ornament Tin Drum ca 1910. 2" (5 cm) is this fine Christmas Ornament Tin Drum ca 1910..Lithographed on top with Drumsticks. Lovely for the collector of early christmas Ornaments! Letter opener / Paper knife Ormolu fra Erhard & Söhne ca 1880. 1 3/4" Letter opener Ormolu fra Erhard & Söhne ca 1880.Nice impressed design on handle.Nice on the desk!